Who says you can’t have a BBQ if you’re not a carnivore? Not us! You can easily spice up veggies, grains and beans with many tangy, crowd-pleasing sauces. Try some of our favorite recipes below and for more inspiration, go to:http://www.vegetariantimes.com/recipe/carolina-style-barbecue-sandwiches andhttp://www.seriouseats.com/recipes/2014/03/the-best-black-bean-burger-recipe.html. Combine all ingredients in a large mixing bowl. Taste for seasoning and refrigerate for a minimum of 2 hours (4 hours is ideal.) Enjoy with chips or as a topping for a black bean burger or grilled portabello mushroom. Skewer the paneer, tomato and peppers, alternating on the kabob. Refrigerate. Combine all other ingredients in a 2-inch baking dish. Place the kabobs in the dish and pour the mixture over the kabobs until completely coated. Cover and chill for at least 2 hours. 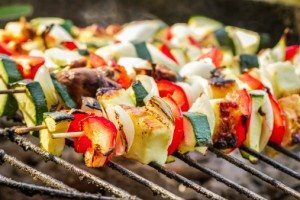 Liberally coat your grill with canola oil and place kabobs over medium high heat. Cook each side for about 3 to 5 minutes. Remove and sprinkle with salt and pepper. Serve with chopped cilantro and lime if desired. Combine crema ingredients and set aside to chill. Place burger ingredients in a food processor and pulse until combined. Form into four patties set on a greased tray and chill to almost frozen. Cook on grill over medium heat for approx 4 minutes each side. Flip once. Remove and serve with crema on a toasted wheat or multigrain bun.